As a boy, I was entranced by Gerald Durrell’s description, in his brilliant account of his idyllic childhood in Corfu My Family and other Animals, of how he came to name his coracle-shaped boat the “Bootle,” only to have appended onto it, the word “Bumtrinket,” at the suggested of his brother, the famous author, Lawrence Durrell. My first car was similarly roundish in shape and beetle-like. By that stage, personalized number plates were no longer a novelty of the rich or the petrol-headed but were widely in use. The “Bootle-Bumtrinket” being much too long to fit on a Victorian license plate, I wanted to acquire to the plate: “Bizdouno,” a word that I felt carried phonetically beetle-like connotations. The fervor of my youthful enthusiasm was quickly doused by my horrified mother. “You can’t call your car ‘Bizdouno,'” she exclaimed. “It’s the name your aunt uses to refer to one of her neighbours. She will find out and think you’ve set out to offend her.” Apparently the lady in question was given a nickname that referred to her place of origin, Bizdouni, in Epirus. My motor vehicle on the other hand, originated in an assembly line in Geelong, a considerable distance away. Unperturbed, I insisted upon my chosen name, or by way of compromise, “Bitsoulas” being a contraction of “Glymbitsoulas” a fictional bogeyman used to scare children, having been told that my driving has similar properties. I was all set to register a plate bearing this name, when I discovered that “Bitsoulas” was the name of an extremely popular discotheque in the Athenian suburb of Glyfada, in the nineteen eighties. In the end, having also rejected other options such “Freno” (to remind me to apply the same in a timely fashion) and “Zhaba” the local word in my maternal ancestral village for a large fat female toad (which is exactly what my car looked like), I finally settled upon a license plate bearing the word KAPO, which is good Greek-Australian for motor-vehicle which is why, I believe, my father surreptitiously consulted Vicroads and obtained personalised license plates n my behalf, bearing my Greek initials, KK. Now, whenever I pull up to family or community functions, I am invariably accosted with the question: “Hey KK, what happened to the E?” referring to the fact that the abbreviation of the Communist Party of Greece is KKE in Greek. “I’m a member of the Communist International,” I always reply, “We believe the Revolution will sweep away borders which are bourgeois constructions created in order to dominate workers and thus have no need for the E (which stands for Greece).” This exposition is enough to permit my interlocutors to move on to the next topic. ‘Greek’ license plates in Victoria are fascinating as they provide a unique insight not only into how their owners view their identity but also, how they choose to express this down the generations. 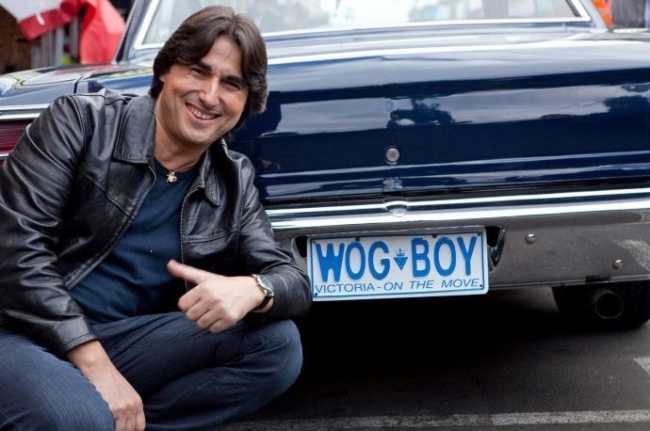 Whereas Anglo-Australians may choose to put their names or nicknames on their plates, the first generation of Greek plate holders have invariably sought to place on their vehicles, their place of origin. Thus, I have throughout the years, beheld plates proudly bearing the words Samos, Sparta, Kalamata, Epirus 1 (whose owner drove on the freeway in front of me, at the same tempo as an Epirot funeral dirge,) Fteri (a village in Achaia), Korinthos, Kriti, Lefkada, Lamia, and countless others. As His Honour Justice Emilios Kyrou outlines in his book Call Me Emilios, such public assertions of identity can often be liberating for those who have had to suppress aspects of their ethnic origin for whichever reason. The owner of the license plate ‘Kosma,’ could certainly relate to this. Proving that one’s region can supply a way of expression of one’s personal identity, driving around Melbourne, one can come across Pontos, Pontus and even Pontia, to describe the female of the species. With such plates, one has to be careful however. The owner of Assos, turned out not to be a Greek claiming that he was the best at everything, but rather, a Turk from the homonymous town, on the Asia Minor coast opposite Lesvos. The owner of the license plate Coglan (meaning young boy or catamite), from which the Greek word τσογλάνι (scoundrel) is derived, was also Turkish. This license plate is a menace to society as I almost smashed into a tree when first I noticed it. Interestingly enough, just as some personalized number plates display affiliations to community groups such as football teams, (there are numerous Greek Australian license plates bearing versions of Greek football team names, ‘PAOK’ and ‘AEK’ being the most common,) members of our community often feel so proud of their local clubs or brotherhoods, that they choose to brand their cars with their names. Thus, in the previous decades, there was a spate of members of the Pontian Association “Pontiaki Estia” obtaining license plates such as ‘ESTIA 1,’ ‘ESTIA 2’ and so on. Such persons still continue to drive among us, displaying a dedication to their club that members of the Greek Orthodox Community of Melbourne and Victoria have not. I am fully in favour of an alteration to that organisation’s constitution in order to compel its president to drive around with GOCMV 1 license plates, or in the alternative ‘Chief’ or its Greek equivalent ‘Tsiftis,’ though I am reliably informed that the latter has already been taken. The Greek Orthodox Archdiocese is possessed of numerous number plates bearing the initials GA. Furthermore, I would love to see how the president of the Benevolent Brotherhood of Kolindros, Pafsilypos would devise a number plate for himself. Further than ascribing to their cars, their place of origin, Greeks also give them labels denoting abstract concepts, as in the case of ‘Agapi,’ unquestionably the ‘Love Bug’ of Greek Australia and paradoxically enough, ‘Oneiro’ for a motor vehicle that does not appear to be particular expensive, leading the viewer to muse whether in fact the owner is dreaming of a better car, or, whether, owing to limited means, his current mode of conveyance represents the extent of his capacity to dream. I regularly see driving around in my local area an ‘Aetos,’ though how the vehicle can fly like an eagle given the proliferation of speed humps in our suburb, is anyone’s guess. ‘Telios,’ could well be as described, though evidently he cannot spell, and as for ‘Alitis,’ the less said about him, the better. Finally, driving around Pascoe Vale a few days ago, I came ‘Atheos,’ meaning Atheist. The fact that someone felt so deeply about denying the existence of a Creator, that they were moved not only to state this in an utterly most public way, but also in Greek, made a profound impression upon me. In years to come, scholars may view this as a public manifestation of the debate that perennially rages within the Greek pages of Neos Kosmos as to the desirability or veracity of Christianity. My own view is that this license plate has been painstakingly calculated so as to elicit the response: «Πω, πω, αυτός δεν έχει το Θεό του.» Incidentally, my parish priest swears that Atheos is often to e seen parked outside the church, for its owner often pops in to light a candle..
As the Greek Australian community becomes assimilated, fewer of its members are choosing to employ Greek upon their personalized license plates, considering such a phenomenon to be outmoded or too ‘woggy.’ Those that do, often attempt to employ words in their wrong context, such as an acquaintance who attempted to register ‘Komvio’ because in Google translate, this was provided as the equivalent of ‘Stud,’ showing how the phenomenon can be used to trace our community’s level of understanding of the Greek language and its accompanying cultural connotations and express these in an intelligible form. Yet for Komvio and for others, such as the owner of ‘Romios’ (literally meaning Roman but referring to a Byzantine/Orthodox identity) the personalised license plate is still a powerful and emotive medium for asserting one’s identity within the context of a multicultural society. Historians and sociologists would do well to study this phenomenon, outlining the social and psychological reasons for its existence as it provides a novel yardstick for the acculturation of our community, prior to its inevitable demise.